*B.P Bulp with valve used in all type of Spygmomanometer ( Aneroid/Mercurial)*Very Good Quality Latex b.p. bulb. * Type - Fingertip Pulse Oximeter; Certification - Approved by FDA; Ideal For - Adults/Pediatrics. * FDA approved pulse oximeter is backed by state of the art technology. It features 6 display modes. Medical oximeter has HD LED display (2 Colors) and AAA batteries. * Easy to use(One button operation); Strong slip Resistant Clip with soft Silicone Padding makes it worthy product to invest in. Pulse oximeter infant features Auto Rotate screen. * Pulse Rate Range - 20 to 300 BPM; Oxygen Saturation Range 0 - 99% to100% Spo2. Pediatric oximeter features Low Battery Indicator, Alarm and audio alarm. * Wavelength of LED - 660 660 Red Light; 940 940 Infrared Light. Pulse oximeter with alarm is durable and efficient to withstand years of use. "Pulse oximeter is one of the most important and crucial medical instruments that help the medical professional to monitor oxygen level and pulse for conditions such as chronic obstructive pulmonary disease (COPD), asthma, Congestive Heart Failure (CHF) and others. Omron Finger pulse oximeter is known to be a great tool that is appreciated by an array of professionals around the world. Pediatric oximeter helps you report reading and thereafter guide the patient accordingly. 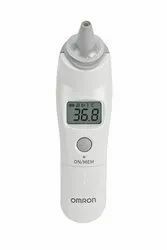 Specifications of Omron * Pulse Oximeter Md 300 C20-Otc- SpO2 • Measurement Range:70% - 100% • Resolution:+- 1% • Measurement Accurancy:70% - 100% : +- 2% • =< 69%: No defination Pulse Rate • Measurement Range:30 - 235bpm • Resolution:+- 1bpm • Measurement Accurancy:30 - 99bpm : +- 2bpm • 100 - 235bpm : +- 2% Display • Type:Dual color OLED • Parameters :SpO2, PR, Pulse bar, Waveform • Mode:6 display modes • Brightness:Adjustable 10 levels Dimension and Weight • Dimension:58mm(L) * 32mm(W) * 34mm (H) • Weight:50g (including batteries) Power Requirement • Battery:2AAA 1.5V batteries • Usage:16 hour continous "
Our company has been successful in winning appreciation from the clients as one of the most prominent names in the trading of Omron Thermometer. 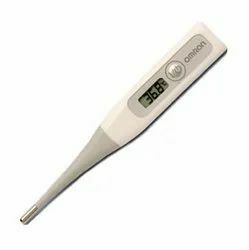 Leveraging on our in-depth domain knowledge and skilled professionals, we have been able to import and supply a quality assured range of Smart Care Thermometers. These are procured from some of the reliable & trusted partners based across the country and are offered to clients in varied specifications. 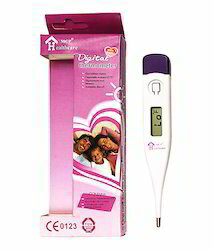 Our range of thermometers is offered to clients at economical prices and within the stipulated time period. Buzzer when measurement is complete.